This Coleman Quad LED lantern has been great for camping this year. It has a neat trick up its sleeve that has been a big hit with the kids. 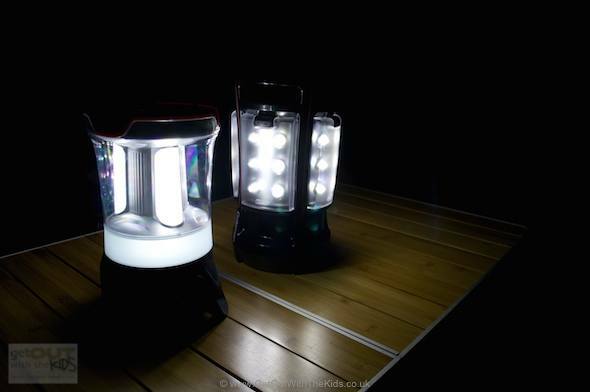 We were very impressed last year with the Coleman CPX Lantern we reviewed. That was not only a great lantern, but had a neat trick up its sleeve: the lantern recharged a small torch that you could dock into and out of the lantern.  This has proved very useful when camping, as you always have a charged torch easily to hand. 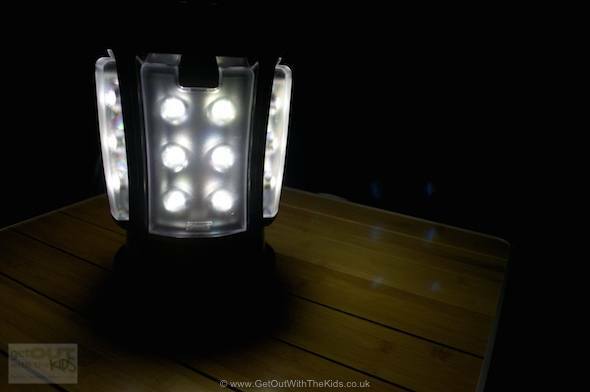 Unfortunately, Coleman has discontinued this lantern, which is a real shame as it's been a very useful addition to our camping kit. 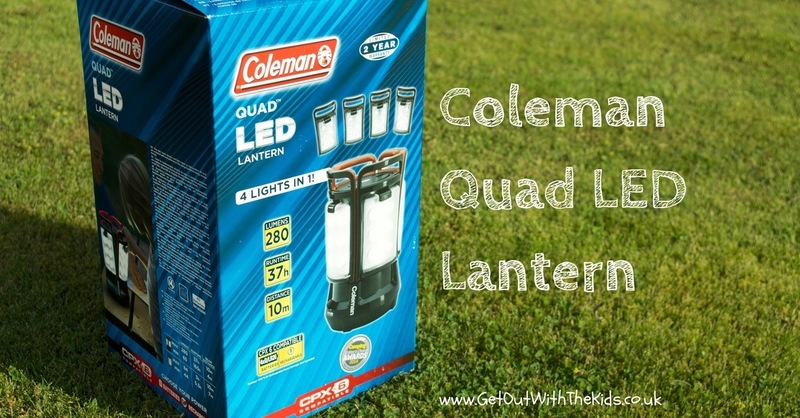 This year the guys over at Coleman sent us over their Coleman Quad LED Lantern. 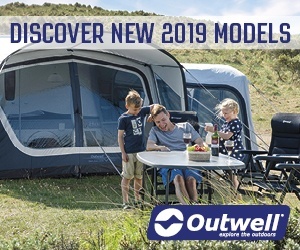 This is another lantern of the CPX 6 family, and so comes with an interchangeable battery pack that works across the range. Each one of the four sides of this lantern can be detached and used as a lantern on its own. You can detach just one, or detach them all. The main lantern unit acts as a recharging base for each of the ‘quads’. This has been a great hit with the kids. They each take a little lantern into their own bedrooms in the tent. As you can see from the picture, each one of these mini-lanterns has a stand. They each have their own switch as well. A panel is supposed to last 1.5 hours when it is undocked from the main unit. We’ve not reached 1.5 hours of continuous use when it is undocked so can’t confirm, but it was long enough for the kids to read, and even keep on as a night light for a while (though it’s quite bright for a night light, our youngest really liked the fact that he could light up his entire sleeping pod with it). 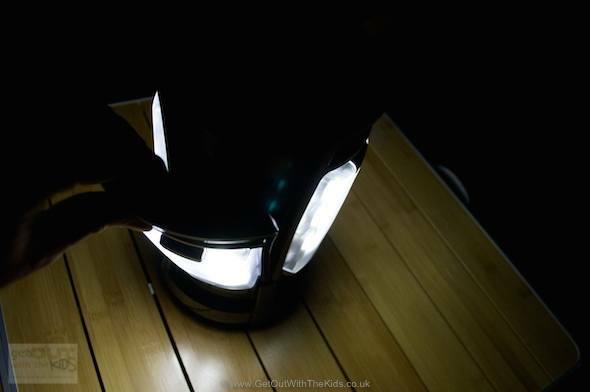 The Coleman Quad LED lantern is best used as a table-top lantern. It’s quite large, slightly bigger than the one we reviewed last year, and is around 30cm / 1 foot high. Plus, with 4 ‘D’ sized batteries and all the quads attached, it is quite heavy too, so not something you would probably hang from the top of your tent. However, each of the little panels are light though, and a good size for kids to use. 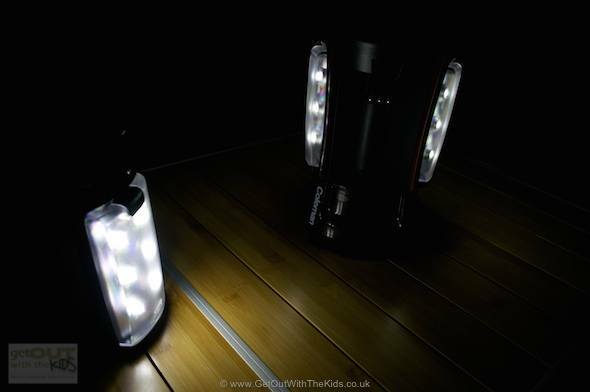 For a table-top lantern, with the ability to give each child their own lantern (and easily recharge them too), the Coleman Quad LED Lantern has proved itself a great bit of kit for family camping and gets the thumbs up from us.